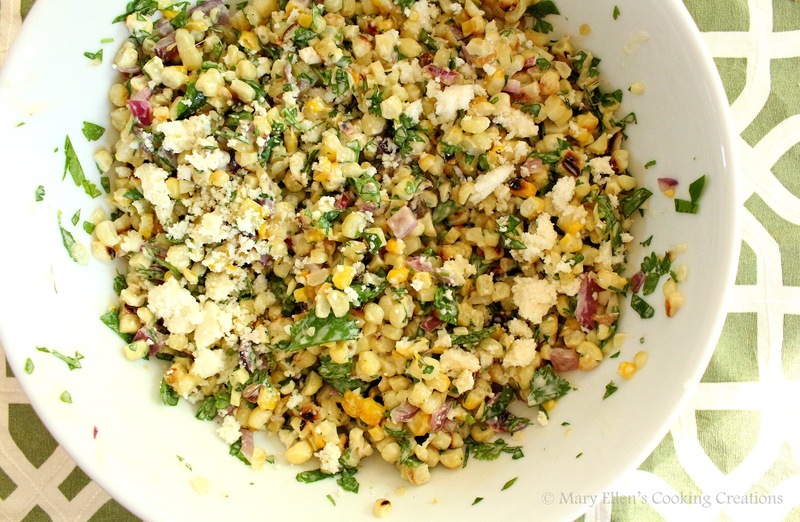 One of summer's stars is definitely fresh, sweet corn. I have mentioned this in my blog before that every week or 2 in the summer, my dad drives across the river to a small farm stand in NJ. He always comes back with the best tomatoes, zucchini, and of course, corn. I like corn on the cob, but my favorite way to enjoy this summer treat is off the cob. The other night I decided to take it out of the husks and grill it for a salad. If you have corn to use, make this salad. I thought it was out of this world good! There are so many flavors going on that just WORK together - the sweet corn, the salty cheeses, the bright cilantro and the bright and creamy dressing - seriously, O.M.G. good! I made a few minor changes by adding grilled red onion, omitting the melted butter, changing the quantities, serving it at room temp (not hot), and in general changing how it was all put together (I simplified it). I plan on making this for every gathering I have as well as every one I go to for the rest of the summer - it was THAT good! So please do yourself a favor and make this ASAP. You will thank me! 1/4 of a large red onion, sliced into rings. Make the aioli: mix the mayo, lime zest, lime juice, lemon zest, lemon juice, 1/2 Tbsp olive oil, Dijon, garlic, and cayenne. Season with salt. This can be made ahead of time and refrigerated. Heat your grill to high. Brush the corn and red onion with olive oil and season with salt and pepper. 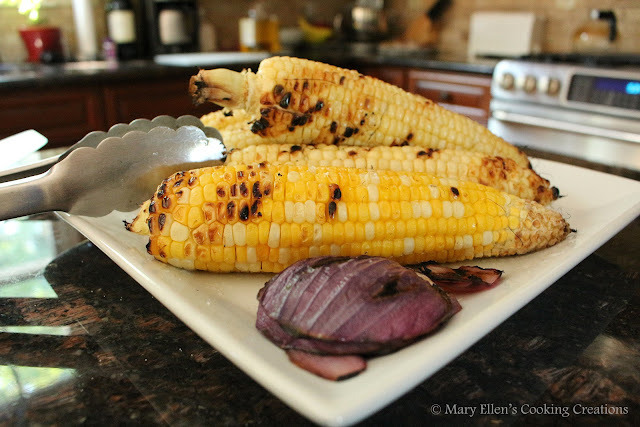 Grill the corn 8-10 minutes until cooked and slightly charred. Let cool before cutting the kernels off the cob and chopping the onion. 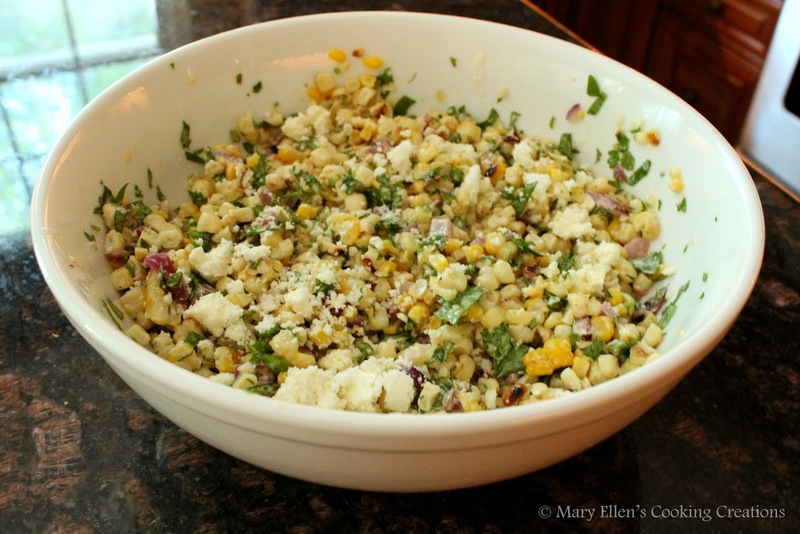 Toss the corn kernels and chopped onion with the cilantro and parsley. Add in the dressing slowly (I didn't need to use all of mine) and then add in the cheeses. Season with salt and pepper, if needed.